Small gardens have some of their own special design rules. Less space doesn't mean less work. If anything, it means more focus on detail and resisting the temptation to add too much variety. Most generally, small area gardens are "boxed in" areas confined to straight lines, straight borders, straight beds, straight walks, and straight walls. When you view a small garden where the whole design consists of mostly straight lines, you can see the whole garden design and landscaping at just a glance. This can make it seem cramped, uninteresting, confined, and. small. Our goal is to design small gardens that feel larger, more livable, and more interesting. Making the most of what little space you have depends partly on the plants you use and partly on design. Small gardens demand special attention to plant selection. But not in the way that most people might think. Colors, textures, sizes, and shapes of different plants can be used to create an illusion of more space as well as being the main "flavor" of your entire garden. Try and limit yourself to two or three colors along with green of course. You'll also get more impact if you stay within the same shade. For instance, moving from light pink to Crimson. Keeping things in proportion is important. However, a misconception about small areas is that you have to use small plants. Generally, the plantings you use in small gardens should stay consistent with the space you have to work with but there are exceptions to this rule. For example, roof tops, balconies, courtyard designs, and city gardens are sometime surrounded by tall walls and boundaries. Trying to soften these with pots and planters of annuals doesn't work as well as a specimen tree or shrub as a background. Using a lot of plants to create a lush look can be tricky. Repetition of a few varieties is the key to using a lot of plants in small gardens. See: Repetition Planting. Usually, it's a big variety and not the amount of plants that seems overwhelming in small space gardens. So if you're going to use three trees, for example, plant three same species instead of three different types. The same applies for other plantings as well. Pick a few plant varieties and two or three colors and repeat them throughout the garden. A great way to use plants in small landscaping plans to create a sense of depth is to put darker colored, rough textured plants to the front of your planting areas and put light colored, fine textured plants in the back. Also, remember to keep the smaller plants in front so they wont be hidden by the taller ones. Keep in mind, constantly expanding your knowledge of plants and their attributes is a major key in more creative design. The more you know about plants, the more creative and adventurous you can be. This is especially true with small gardens. Find out more about plants and planting schemes. Using curves adds a sense of motion and flow, making the garden gradually unfold. And a small garden that gradually unfolds naturally seems larger. Adding something as simple as a curved brick or stone walkway or curved flower bed will not only add an element of interest but will add a sense of extended space as well. Retaining walls, walk ways, and other decorative landscaping projects are relatively easy to create. They are a great way to add the textures of wood and rock into small gardens. 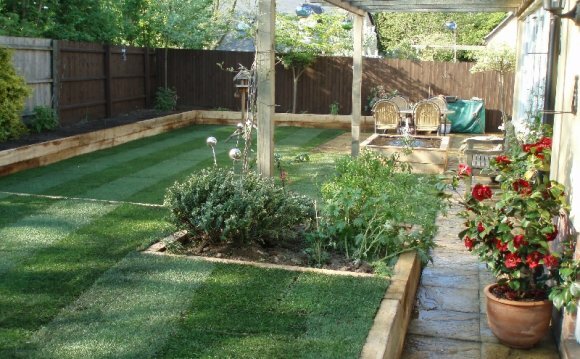 A great way of dividing a small area is by creating different levels. This can be as simple as adding raised beds or creating a sitting area that steps up onto a different platform. This method creates a distinct, visible separation. An upper level can actually be transformed into a whole new world or "theme" from the lower level. You'll be amazed at the "illusion" of space this creates. Another way is by using gazebos, bridges, arbors, and trellises to separate and divide one area from another. This will not only create a sense of flow but also a sense of mystery inviting you on to see what you can't see on the other side. In this way you've created another room and the illusion that the garden goes on and on. Adding elements of interest to small gardens creates more experiences for you and your visitors. And the more experiences the better. This can be as simple as placing plants in special groupings or even groups of colorful decorative landscape rocks. Remember that when you use several groups of plants, rocks, or anything to keep them close to the same theme, color, size, size of group, etc. This helps create unity throughout the garden. Using too many different variations will do just the opposite and will end up looking like clutter. Adding lots of decor to your garden is a great way of adding interest. But try and keep the different pieces of decor related to each other. Too much unrelated stuff can also look like clutter. For some great tips on using and choosing garden decor see garden decor. Choosing the right wall colors is a very simple way to add the perception of depth to small gardens. Using white as a background gives the appearance of extending space, while using black on a corner wall will appear as a shadow and give the illusion of an on-going garden. Placing a whole group of plants against a dark corner can add a mysterious jungly effect to small gardens. This is a really neat "trick" to get a feeling of more space in small spaces. Give it a try and you'll see an amazing difference.